A version of the geo-structural mapping of the study region, based on the gravitational-magnetic data and the mapping of sectors of gasopetroliferous interest, linked to the conventional oil of the Placetas Tectonic-Stratigraphic Unit, is offered, based on the presence of a complex of indicator anomalies. The source materials are: the gravimetric (Bouguer reduction 2.3 t/m3) and aeromagnetic (reduced to pole) maps at a scale of 1:50,000; airborne gamma spectrometric maps (channels K, Th and U (Ra)) at scale 1:100,000; the Digital Elevation Model (90 × 90 m) and; a result map of remote sensing for the search of perspective gasopetroliferous sectors in the region of Guanabo-Seboruco. The processing consisted in the regional-residual separation of the gravimetric and morphometric fields, the calculation of the derivative of the magnetic field inclination and of the ratio of the K/Th spectrometry channels. The indicator anomalous complex considers the following attributes: low-amplitude local gravimetric maximums; minimum K/Th ratio and local maximums of U (Ra) at its periphery; local maximums of residual relief and remote sensing anomalies. 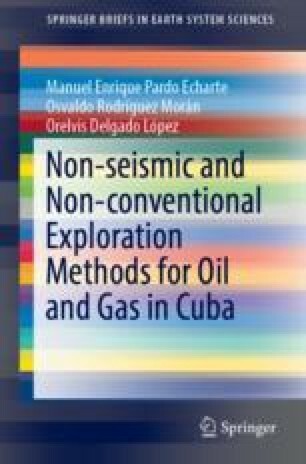 The result is a complementary non-seismic information, essential for the necessary geological–geophysical–geochemical–morphometric integration of the territory. As a result of the geo-structural mapping from the gravi-magnetic data, a wide distribution of the Zaza Terrain (volcanic + ophiolites) can be observed in the study region. The main structural depressions are concentrated along a latitudinal strip that covers the following locations (from east to west): Southwest of Matanzas Bay, Ceiba Mocha, Aguacate, Bainoa, Tapaste, Cuatro Caminos, Managua, and Santiago de las Vegas. Based on estimates of the reduced at the pole magnetic field, the depth at the top of a target located to the west of Bainoa, within this strip, is 1350–1450 m, which gives an idea of its sedimentary thickness. The results of the integrated prospective cartography consider, in a first level of perspective, three localities (Boca de Jaruco, Jibacoa del Norte and Este de Aguacate) where all the studied anomalies (attributes), with the exception of the morphometric ones, appear. In a second level of perspective, the localities that correspond to the combination of two types of different anomalies (11 localities) are considered.